Above, a video visualizing two of our participants’ ECG responding to music in real-time. Yellow and green lines represent their ECG’s, red the level of synchrony between them. 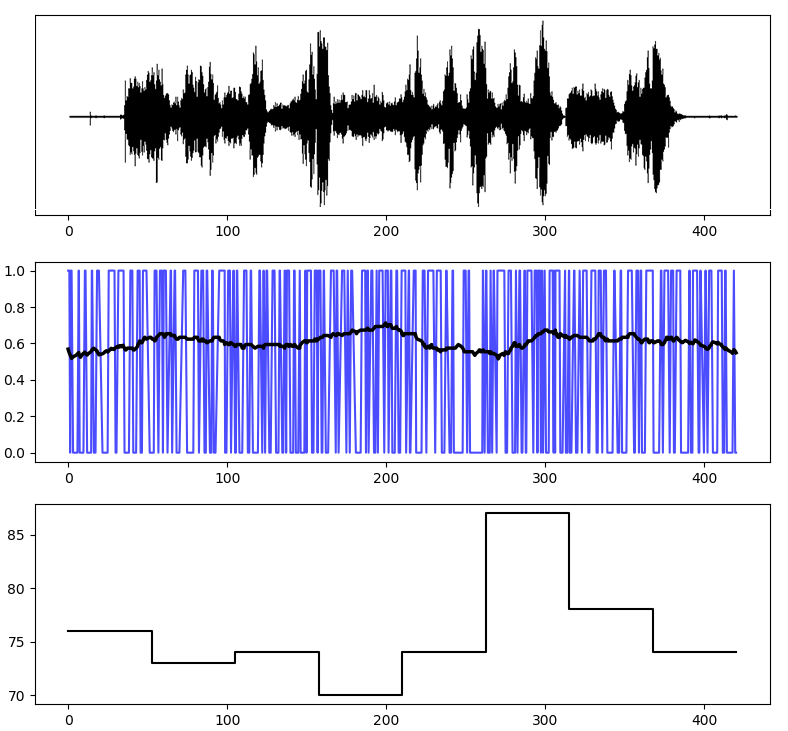 The audio is a live recording of the experiment and is synced to the plots. A GitHub repository with all source code can be found here. In this, the set-up of the study is both open-ended and exploratory, with the intention to gain new insights in how people respond in different (physiological and psychological) ways to various forms of music. Though the experiment was relatively limited in scope, it did inform the team that it would be useful to complement the Bobbi with other wearables – such as those of IMEC. And that, to be able to get a better grasp on the interactions between the music and subjects’ psychophysiological responses, it would be important to synchronize the music with all physiological measures, preferably with millisecond accuracy. 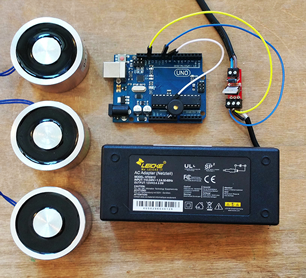 The Bobbi Sync Device consists of a basic Arduino / MOSFET based circuit1 controlling three strong, of the shelf electromagnets (Intertec ITS-MS-5030 400 N 12 V). It can generate a series of short, precisely timed2 magnetic pulses — which are automatically registered by any Bobbi’s3 placed on or near the device. Which enables us to synchronize up to hundreds of devices at a time — pre-empting the need for complex, and often fragile, Bluetooth or WIFI based synchronization protocols. As a bonus, the Bobbi Sync Device can also beep in sync with each magnetic pulse. These beeps can then be recorded, after which the resulting audio recording can be synced with Bobbi’s ECG measurements as well. For the current setup, we recorded the whole experiment, from start to finish, with an audio recorder app on a Samsung Android smartphone4. 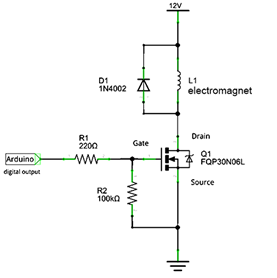 1 Arduino source code can be found here. 2 By default ten 500 ms square wave pulses at 500 ms intervals. 3 Or any other magnetometer equipped wearable or MCU based dev board — that is, most of them. 4 Starting the recording some time before the first ten beeps, and stopping some time after the final beeps. The sync device was tested during the “Music as Medicine” group’s second pilot experiment, at Mariënburg, Den Bosch (the data science campus of JADS). A wristband measuring skin conductance, skin temperature, and movement. The participants were then seated in the Marienburg chapel, where they listened to classical music selected by Andre Heuvelman – who, as a bonus, gave a solo performance of 10 minutes after the experiment. Ravel’s Pavane pour une infante défunte followed by the Nocturne of Mendelssohn’s A Midsummer Night’s Dream. Fauré’s Pavane followed by the first part of the prelude to his Pelléas et Mélisande. The third movement of Haydn’s Symphony No. 44. 3 By controlling our Arduino with Eltima’s Serial Port Monitor Pro, which offers time stamped logging. On completion of our recording, we acquired the data from all Bobbies in the form of CSV data files. Each file contains ECG, the magnetometer x/y/z signal (which registers our Sync device’s pulse) and more. Information on the data structure of these files, and some general tips on how to analyze Bobbi ECG data can be found here. Regrettably, most of the Totem Bobbi’s we received had not yet been updated to the latest firmware version. With the result that only one of our Bobbi recordings was 100% complete. Next, let’s move to some random point in time right in the middle of our experiment. In the top panel, the magnetometer now registers the earth magnetic field. But take a look at that ECG signal in the bottom panel: upside-down, but also clean and well defined. So now we have an audio recording and the Bobbi data files, all cut to size and containing clear start and stop sync pulses. Next step: running some first exploratory analyses. As can be seen in the averaged SPIKE-Sync profile plot (the final one), there seems to be some heartbeat synchronization overall – which grows towards the end, then lowers again. Very intriguing – but also very preliminary and possibly random. So, for now, I am now keeping my fingers crossed for this pattern to hold up in a next pilot, with more participants, and more up-to-date Bobbi’s’.